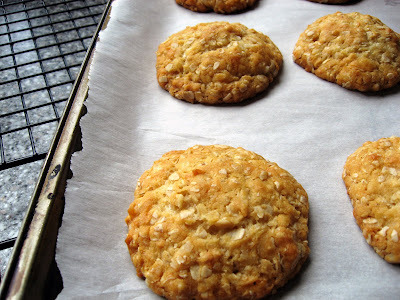 These biscuits are chewy and buttery and, as they last a while they are a great hiking biscuit. They are a traditional Australian and New Zealand biscuit (ANZAC stands for Australian and New Zealand Army Corps) and they were used in wartime (specifically WWI) as a nutritional snack that would survive the trip over to the war front. Now, they are traditionally eaten on April 25th which is ANZAC day (the equivalent of Veterans day). 1. Preheat the oven to 325F and line two baking trays with parchment paper. 2. In a large bowl place the oats, flour, sugar and coconut and mix with a wooden spoon to combine the ingredients. 3. Place the butter and golden syrup together in a saucepan over low heat, and let them melt together. 4. In a small bowl stir the hot water and bicarbonate soda together. 5. Pour the water and bicarb soda mixture into the butter mixture. 6. Pour the butter mixture over the dry ingredients. 7. Mix well using a wooden spoon. 8. Using a tablespoon to measure out the amount place 1 Tbs of the mixture in your palms and then roll together into a ball. Place on the baking trays with enough room for expansion (these do flatten out quite a lot). 9. Bake for between 10-15 min (check after 10min) until they are golden brown. 10. Allow to cool for 5 min and then remove the biscuits and place on a wire rack to cool down completely. Taken from: Donna Hay "Modern Classics Book 2" p.16. You previously had a different recipe. What happenend? Those look good. 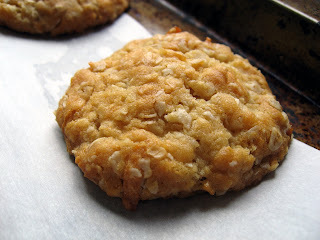 I like the butter, oat and coconut combo. Ooops! I apologize, I'm getting all my food blogs confused! 101 Cookbooks posted a recipe very similar. Haha! No probs Charley - I saw them on tastespotting as well (very cute love hearts)! These look wonderful! So pretty and golden. I was first introduced to anzac bikkies in Australia and I love them!